Should the Packers Pursue Revis Island? 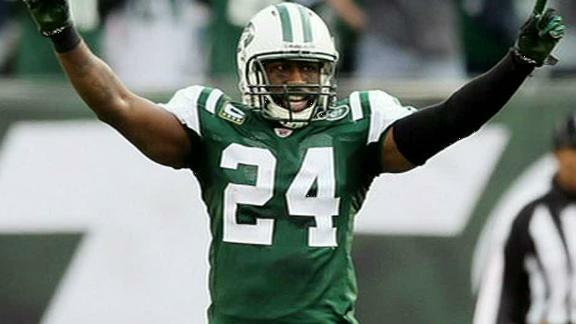 Could Revis don the Green-and-Gold next season? Though possible, it’s a luxury the Packers cannot afford. Because the J-E-T-S cannot yield the spotlight, Woody Johnson made it know this week that Darrelle Revis – the undisputed best corner in the league – is available via trade. The 27-year-old CB is coming off an ACL injury, which may be allowing this type of player to hit the market. But, even with an ACL injury, there are sure to be many suitors for his services. So, are the Packers one of those teams? Given the Packers recent struggles on defense (especially with Tramon’s end of season disappearance), it should be of little surprise the Packers are being linked to these rumors. Trading for Revis would improve one of the deeper set of defensive backs in the league. Starting Revis, Williams, Shields, and Hayward, with House as the 5th back, would be the envy of all teams. And in a division with Megatron, Brandon Marshall, and (deep breath) Jennings (if he dons the Purple), housing Revis would go a long ways in controlling opposing passing offenses. And with a secondary that can go five-deep, it should allow the front-seven more time to get after the QB. You can be sure Matthews would greatly appreciate the extra split second to close on another sack. So, yes, it makes sense on the surface. But, there are several issues with making this type of move that cannot be ignored. First, Revis is coming off an ACL injury. It’s impossible to predict how he’ll play upon his return. AP’s dominance less than a year removed from a similar injury gives hope. But, it’s not hard to think of players that never regained their prior form following the same injury. It’s a risky proposition, even for a player of Revis’ caliber. Second, to state it nicely, pulling off this trade isn’t exactly TT’s modus operandi. But recall, TT traded UP in last year’s draft on three occasions. Could TT’s evil step-brother strike again? In order to swing this deal, multiple picks and potentially a player or two would have to be traded away. Daunting, maybe. But, not impossible. A deal including our first-round selection, a later pick or pick in next year’s draft, and Jennings (after franchising him) might get it done. You could include Tramon instead of Jennings. Or, frankly, offer up a collection of players for them to choose: Jennings, Tramon, Finley, Hawk, etc. The Packers have the assets to pull off the deal. It’s the effect of the deal that raises two issues that simply cannot be overlooked. Revis will demand a “max” contract – borrowing language from the NBA – when his current contract expires in 2014. In order to sign Revis, you will not be able to retain all three of Rodgers, Clay, and Raji. Obviously, the odd-man out will be Raji. But even still, having three “max” contracts completed so close together will further impact the Packers ability to retain other core cogs of the team: Shields, Jordy, James Jones, Bulaga, etc. The toughest aspect for fans to appreciate is how mega-contracts for Rodgers, Matthews, and Revis impact the teams ability to keep the core together. Without Raji, the Packers would be unable to stop any running game. Assuming Raji would be the odd man out in this situation, losing him would be too costly for this team. There is simply no one on the team like Raji. You lose Raji, you lose any ability to stop the run. Pickett is a good run stuffer, but he’d be the only load up front for opposing offenses to contend with. And he’s advancing in age. So, without the young legs of Raji up-front, a secondary that can blanket anyone might not matter when teams run it down our throat all game long. The easy solution would be building the line through the draft. But, as we’ve witnessed, it’s not always that easy. Worthy, Neal, and Daniels are all draft picks that define players that can occasionally flash, but are absent for long stretches of the game. 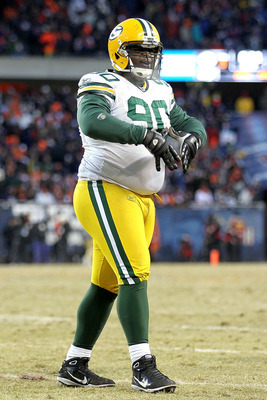 It seems ridiculous to say that Raji is a deciding factor in not making this move. I mean, it’s a no-brainer who’d you rather have on the team when considering them alone. But, given the depth at CB, lack of depth on the D-line, and cap space to pull of this deal, trading for Revis is a luxury the Packers simply cannot afford. This entry was posted in Home and tagged B.J. Raji, Darrelle Revis trade, Green Bay Packers, Greg Jennings trade, Jennings Vikings, NFC North WR, Packers free agents, Packers offseason, Packers trade, Packers trade Revis, Revis Island, Revis Packers, Revis to Packers, Revis trade, Revis trade suitors. Bookmark the permalink.